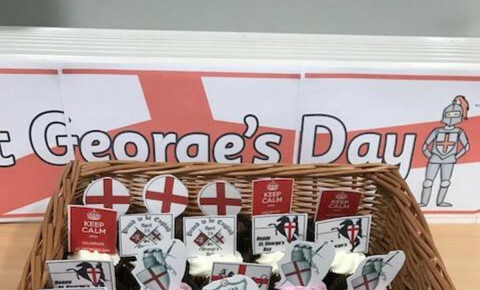 Busy Bees QE has received a right royal reason to celebrate St George’s Day after the leading provider of childcare in the UK was named as the inaugural winner of the Queen’s Award for Enterprise: Promoting Opportunity. The accolade, handed out in honour of the Queen’s 92nd birthday, recognises the organisation’s social mobility programme and commitment to quality training for its early years apprentices. The nursery, located at the QE, currently has 6 apprentices and trainees who make up some of the 3,765 employees across the UK that Busy Bees has upskilled to date. The nursery marked the day and award with cakes after receiving the news that morning. Chief Academic Officer and co-founder, Marg Randles OBE, said: “Receiving the Queen’s Award is a real milestone for Busy Bees, reflecting 30 years’ work promoting opportunity in the early years sector. It recognises that our success is down to helping the incredible people we employ, like the team at Busy Bees QE, to reach their potential, which in turn gives our children the best start in life. If you would like to know more about the nursery, please contact Sara or Sharon, nursery managers. You can also book a show round to take a look at what we have to offer or check our careers section so you too can join Busy Bees QE.